Thank you for choosing to donate to Arts 4 Dementia! Your support will enable the spread of our groundbreaking initiatives to enhance life for people with dementia and their carers. From your donation now, to setting up regular giving, to creating a legacy, your generosity will make a real difference to help re-energise and inspire them through artistic stimulation. A4D works with arts organisations to train workshop leaders and to initiate programmes that will change thousands of lives. South Asian Dance with Akademi in Camden, who are now working with other groups. Our next programme will be Scriptwriting at the Royal Court Theatre, from January 17, 2019. 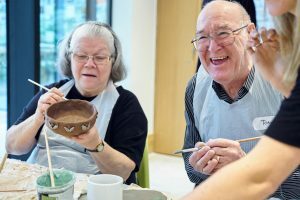 Over 600 arts facilitators have now taken our training and are delivering arts opportunities to people living with dementia and their carers to over 12,000 people a year, all around the UK. Your gift transforms lives. Thank you! I want all donations I’ve made to you in the past four years and all donations in future to be treated as Gift Aid donations until I notify you otherwise. We keep a record of all payments and donor contact details and these may be required by HMRC. We promise not to abuse your agreement to accept communication from us.